September was definitely going to be a hard month for me to stay on track. It was my birthday, and I was away for 2 weeks at the start of the month. I did make some smart choices whilst I was in America, however since getting back I definitely tried to step up my game again. It's not been the easiest, but I now feel like i'm eating as normal again and trying some new things. 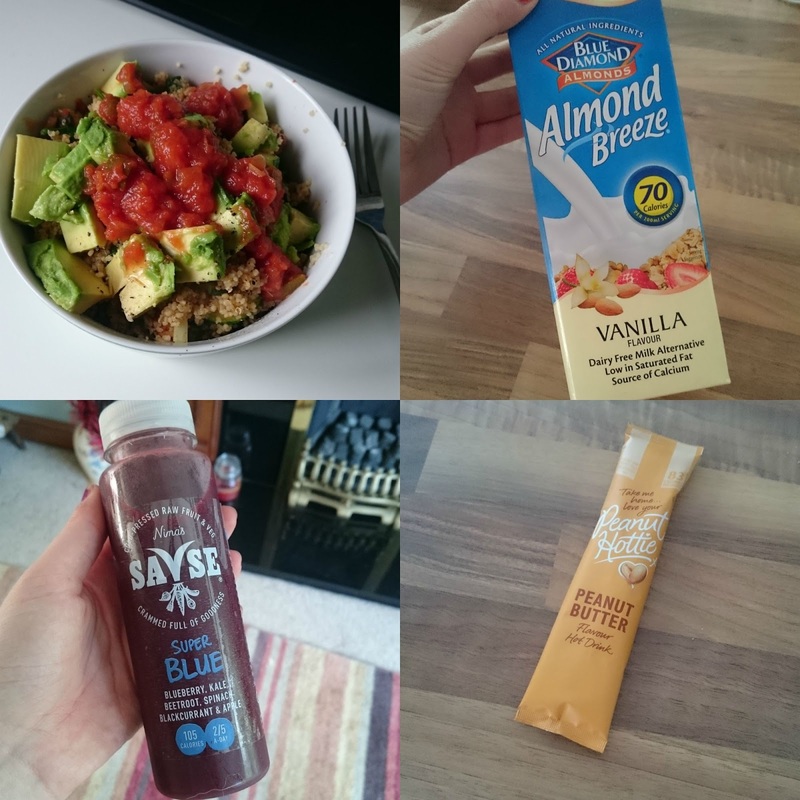 One thing I did when I was away is I took some of my own healthy snacks which definitely helped to stop mean reaching for sugary treats all the time. I did a post on some healthy snacks but one of my favourites has been Bounce Balls. 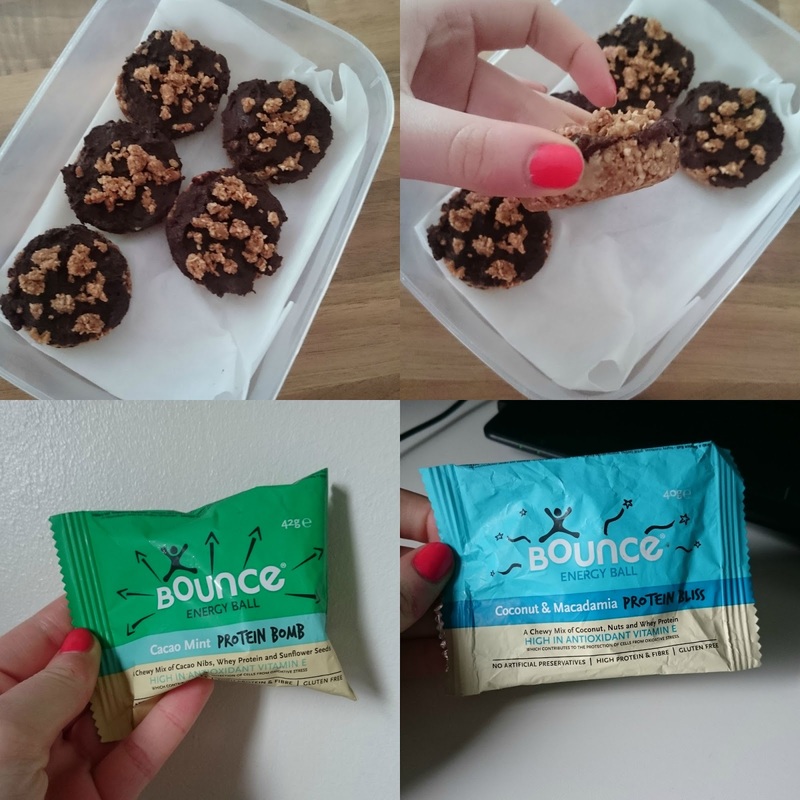 These aren't the cheapest, but taste amazing and really helps if you're having a mid afternoon slump or need an easy post workout snack. This week I made these amazing Chocolate Oat Bars. I found the recipe on Pinterest and they're healthy, vegan and super tasty. They were easy to make and I will definitely be trying some more variations in the future. Now that it's getting colder i'm craving a warm lunch. My favourite is cous cous with veggies, avocado and salsa. It's warming as well as being filling. This variation I added quinoa as well to up the protein as well as being a different texture. I've picked up these Nina's Savse Juices I few times when i've been out; I like the Super Blue and Super Green ones. These are cold pressed juice full of fruit and vegetables and are pretty good. I don't have juices a lot but these aren't too high on calories and are good if you need an energy boost whilst you're out. I made some great discoveries on the food shop this week, first this Peanut Hottie Peanut Butter hot drink. I was on the fence about this but it's so good and almost tastes like you're drinking peanut butter. You can have it hot or cold in a milkshake which I will definitely be trying. The other was Vanilla Almond Milk, i've heard America Youtubers/Bloggers talk about this but never seen it in the UK until now. It's pretty awesome and will be perfect in smoothies, hot drink and desserts. Next month i'm excited to fully get back into eating healthy and trying new recipes. The colder months can sometimes be harder to stay on track but I will be trying out some warming dishes to fill me up whilst being good for you. At the moment i'm trying to find some more healthy breakfast options which if I find some good combinations I will share some recipes. What have been your health favourites recently?